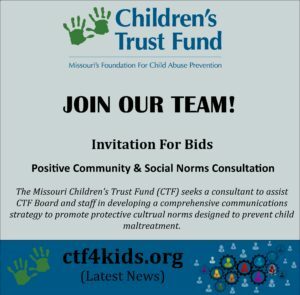 The Missouri Children’s Trust Fund (CTF) seeks a consultant to assist CTF Board and staff in developing a comprehensive communications strategy to promote protective cultural norms designed to prevent child maltreatment. The Children’s Trust Fund (CTF) is Missouri’s foundation for child abuse prevention. CTF was created by the Missouri General Assembly in 1983 as a 501c(3) non-profit organization with the sole purpose to prevent the abuse and neglect of children. Located within the Missouri Office of Administration, CTF is governed by a seventeen member Board of Directors. Implement a process to collect, identify, evaluate and assess social and community norms related to prevention, child maltreatment and child well-being in Missouri. Foster a statewide approach involving Missouri state departments, other public/private agencies, stake holders, grantees, etc. to participate in decision-making and to encourage a unified effort to address child abuse prevention through the promotion of desired social norms. Complete an assessment of Missouri residents to inform baseline data, including reviewing available relevant data, conducting surveys, polling, etc. The consultant will provide technical assistance specific to developing social norms questions/survey instrument for the determined survey platforms, which an outside entity may be used to administer. Review and assess data to identify attitudes, behaviors, misperceptions, gaps, etc. and identify 2-5 social norms related to preventing child abuse (including child sexual abuse) that will be the basis for strategic communication messaging. Develop data-informed messaging based on the identified social norms to deliver to the Missouri-based advertising/media company of CTF’s choosing, which CTF and its team will be in regular contact to inform and guide the work to ensure successful delivery of the creative design and execution of the plan. Evaluate the process and impact of the social norms messaging in preventing child abuse and neglect in Missouri. Identify the primary individual(s) who will work on this project. What are the applicant’s individual and/or agency experience and knowledge related to conducting child welfare, child maltreatment or child well-being research? What is the applicant’s individual and/or agency experience in assessing social norms and developing a social norms communications campaign? Why is the applicant interested in working with CTF on the issue of child abuse and neglect prevention? Please provide a Scope of Work, including a related timeframe, for the requested project. What is the proposed budget amount to conduct the tasks outlined in the Scope of Work (assuming a contract period of January-June 2019, July 2019-June 2020, July 2020-June 2021, July 2021-June 2022)? Completed proposals shall be emailed to Paula Cunningham at paula.cunningham@oa.mo.gov by 5 p.m. Friday, October 19, 2018. Selection shall be based on the best and lowest bid. Further inquiries may be made to Paula by email or by calling 573-751-2266/5147. Thank you.